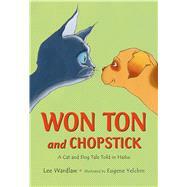 Lee Wardlaw has published nearly thirty award-winning books for young readers, including Won Ton: A Cat Tale Told in Haiku and Red, White, and Boom! She lives in Santa Barbara, California, with her family. Eugene Yelchin is the illustrator of Won Ton: A Cat Tale Told in Haiku and the author/illustrator of Breaking Stalin’s Nose, which earned him a Newbery Honor in 2012. He is also the author/illustrator of Arcady’s Goal. He lives with his family in Topanga, California.